Buy or Sell AED in India Easily! How To Buy Dirham in India? Why Buy Dirham Online via ExTravelMoney? AED to INR rates can fluctuate very much even on the same day. With Extravelmoney, you can observe and lock the rate when it is favorable. Just pay a small fully refundable rate lock fee & lock the rate for as much as 3 days! 1. What currency can be used in Dubai? The UAE dirham (AED) is the official currency of the Dubai and is the accepted legal tender there. US dollars, British pound and Euros are also widely accepted in Dubai as Dubai is a tourist friendly destination. 2. Can you use US dollars in Dubai? Yes you can use US dollars in Dubai. However, you’ll lose money on every transaction you do with USD. That is because the exchange rate you’ll be given for US dollar will be bad there. The prices of items and services will be mostly in AED. Hence it is better to exchange your US dollars to UAE dirham when going there to avoid money loss to bad exchange rates every time you try to pay with USD. 3. How much cash can I carry from India to Dubai? You can carry up to USD 3,000 or its equivalent in UAE dirhams (approximately AED 11,000 at today’s AED rate in India) as cash. If you want to take further money, RBI allows up to a maximum of USD 10,000 or its equivalent UAE dirhams (approximately AED 36,600) to be carried in forex card or traveller’s cheque or both. 4. Is it best to change money in Dubai? 1. UAE is a developed country and usually the exchange rate for currencies, given by money changers, is worse in developed countries than in developing countries. 2. The Indian rupee is a restricted currency. That is, the flow of Indian rupee outside India is strictly controlled by the RBI. You can, at the maximum, carry only Rs 25,000 in Indian currency when going abroad from India. This amount would not at all be enough to cover your expenses in Dubai (That is even if you are lucky enough to find a money changer or bank ready to exchange Indian rupee for UAE dirhams). So be prudent and convert Indian rupee to UAE dirhams before your trip itself. 5. Best forex card for Dubai? The best forex card for Dubai would depend upon the advantages of the chosen forex card. A forex card preferably with with no activation charges, ATM withdrawal fees abroad, inactivity fees and zero encashment fees would be most welcome. Another important factor to keep in mind is the exchange rate at which the bank or money changer is ready to load US dollars in the forex card. The forex store offering the best AED-INR rate should be considered. To find the best forex card for Dubai, simply choose from the many multi-currency forex cards available in ExTravelMoney. Take a look at the exchange rates of forex cards offered by different forex vendors and banks in your location. Compare and find the forex card offering the best exchange rate. You can then book the forex card online and get it door delivered to your home or office! 6. What is the best currency to take to Abu Dhabi? The local currency used in Abu Dhabi is the UAE dirham (AED) No other currency beats the advantages gained by carrying the local currency of a region. Thus it holds to reason that the best currency to take to Abu Dhabi would be the UAE dirham. 7. How to convert Indian rupees to UAE dirhams? If you are going to UAE from India, then you need to convert Indian rupee to UAE dirhams before flying there. To do that, either visit your bank or an RBI authorized money changer near you. However, if you want to convert Indian rupee to UAE dirhams at the best possible exchange rate, then you’d need to visit each money changer store near you. Only after enquiring their exchange rates would you be able to find the best rate among them. Short on time and don’t want to spend an afternoon visiting each forex store in the hot sun? Simply visit extravelmoney.com, online forex platform, using your phone or computer. Compare exchange rates of forex stores online. Book UAE dirhams at market beating exchange rates from forex stores near you and even get the currency delivered to your home! 8. How to convert UAE dirham to Indian rupee? Converting UAE dirhams to Indian rupee is a pretty simple task with extravelmoney. Simply look up money changers near you through the online forex platform. See which money changer gives you the best rates for selling UAE dirhams. Select the money changer and place your order online! Don’t have time to come to the forex store to do the exchange? Select door pickup of UAE dirhams and get Indian rupee credited directly to your bank account after the pickup. ExTravelMoney is your one stop solution for all forex needs. 9. 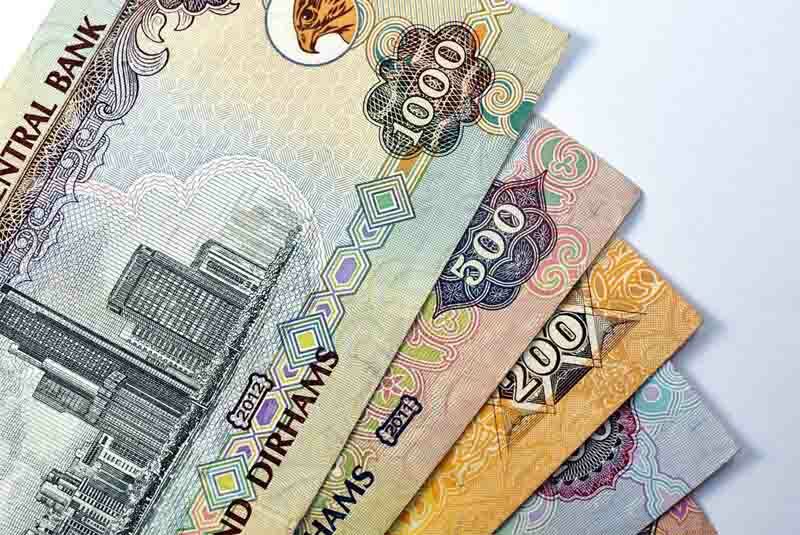 What are the UAE dirham denominations? The UAE Dirham (AED) is the official currency of the United Arab Emirates comprising of Abu Dhabi (capital), Ajman, Dubai, Fujairah, Ras al-Khaimah, Sharjah and Umm al-Quwain. The UAE dirham is divided into 100 fills. The UAE currency note denominations are AED 5, 10, 20, 50, 100, 200, 500 and 1,000. The denominations of the coins are 5, 10, 25 and 50 fils and 1 dirham. 10. What are the documents required to sell foreign currency in India? If the amount of foreign currency to be sold exceeds USD 5,000 equivalent in cash or exceeds USD 10,000 equivalent in total, you will also need to furnish a Currency Declaration form.